The Graduate Management Admission Test (GMAT) is a standardized test owned and operated by the Graduate Management Admission Council (GMAC). ACT helps develop the GMAT questions and Pearson VUE helps administer the exam through its test centers. More than 5,000 graduate school programs worldwide use the GMAT in their admissions process. The GMAT is only given in English. You have 3 hours 7 minutes on the GMAT to answer questions in the various sections. Including the initial tutorial screens, the two breaks, and the ending score reporting screens, the total length of the GMAT is approximately 3.5 hours. The default GMAT format is shown in the table below. More information about each of the questions is given in our Question Types pages. The GMAT has a Select Section Order feature, which allows you to take the GMAT sections in two additional different orders, as shown in the tables below. The timing for each section and the question types in each section remain unchanged. You choose the section order at the test center on the computer immediately prior to the start of your exam. We highly recommend selecting one of these alternate orders. Since the IR and AWA sections do not count towards your main GMAT score, it’s best to save these sections for last, at which point mental fatigue is likely to set in. Each section generates a separate section score, plus you get an overall score from 200 to 800 that encompasses only the quantitative and verbal sections. Accompanying percentile rankings indicate the percent of test takers who score below that level, based on data from all test takers in the three-year period prior to your score report date. More than half of test takers score between 480 (24%) and 650 (75%). At higher levels, a small increase in points can mean a big increase in percentile ranking. For example, moving up just 30 points from a 640 (70%) to a 670 (81%) puts you ahead of an additional 11% of all test takers. Since most test takers are stronger in either math or verbal, a strong performance in both areas can lead to an even higher overall score and percentile ranking (e.g. 69% math + 83% verbal = 88% overall, not an average of 69% and 83%). Over the past decade, an increasing number of students from math-proficient countries (e.g. China and India) have been taking the GMAT. Because of this, math and overall scores have increased over time and math scores overall are higher than corresponding verbal scores. Since overall English-proficiency is lower in these countries than in the U.S., AWA and verbal scores have decreased slightly over time. As a result, a high verbal score has slightly more impact on your overall score than a corresponding high math score. The table below summarizes three-year historical score performance, based on the latest data provided by the GMAC. For each percentile, we have taken the closest score. Note: Percentiles for mean scores are estimates. The GMAT is a computer adaptive test (CAT). You take the GMAT on a PC-based desktop computer (with basic, non-ergonomic keyboard and mouse) provided to you at the Pearson VUE test center, so familiarity with using such a computer is obviously helpful. Furthermore, your ability to type quickly is beneficial on the AWA essay section. You must answer questions in the order presented, cannot skip questions, and cannot return to previously viewed questions. Since the computer can immediately grade all sections except for AWA, you receive an unofficial score report upon conclusion of your test. The quantitative and verbal sections are adaptive, which means that question difficulty varies based on your prior performance. 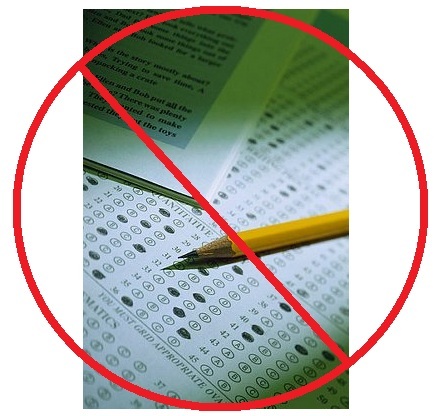 Unlike the SAT, the GMAT does not give all students the same questions. Associated with each question is a scoring characteristic curve, which is somewhat analogous to a difficulty level. The first question in the math section is of medium difficulty. A correct answer leads to a harder question, whereas an incorrect answer leads to an easier question. As you proceed through the math section, the change in question difficulty gets incrementally smaller. The test is trying to narrow-in on a theoretical difficulty level at which you answer correctly, but would answer incorrectly at a slightly harder level. To ensure fairness and consistency, the test also makes sure to present a predetermined balance of concept and question types. Your score for the section is determined by the number, difficulty, and statistical characteristics of the questions you answer correctly versus those you answer incorrectly. This process starts over for the verbal section, because your performance in the math section in presumed to be irrelevant to your verbal skills. One big fallacy of the adaptive format is that earlier questions count more and you should therefore spend lots more time on earlier questions. It is true that the change in question difficulty is greater earlier on, and that missing several of the initial questions can lead to a low scoring level that you must recover from. So it is fine to spend an extra 15 to 30 seconds selectively on a few of the early questions as needed. But don’t spend so much time early on that you run out of time at the end because there is a huge penalty for not finishing all questions. If at the end of a section you leave questions unanswered or have multiple incorrect answers (interpreted as random guessing due to insufficient time), your score will drop significantly. The GMAC has provided an example of a test taker who, at the 70th percentile before leaving the last five questions unanswered, dropped down to a 55th percentile score. The degree of drop depends on your score, with a higher score receiving a greater penalty for running out of time. Given this penalty, pacing is a critical aspect of the GMAT. Manage your time effectively so that you do not run out of time at the end. For the last question in each section, you must confirm your answer to have it counted. If you choose an answer but the clock runs out before you confirm, the test considers this unanswered. A good way to check your pacing is to multiply the number of questions you have left in a section (including the question you are working on) by two (by 2.5 for IR). This is approximately how many minutes you should have remaining on the clock; if you have less time available, you will need to make some time up. It is fine to spend up to three minutes on some questions if that time is made up by spending only 30 seconds to one minute on other questions. Inevitably some questions will take longer to complete, whereas others will take less time. In particular, some DS math and SC verbal questions can be answered very quickly if you immediately identify the relevant concepts / rules tested on the problem. Because timing can be a challenge, you will sometimes need to make an educated guess, no matter how skilled you may be. Eliminate as many answers as you can and take your best guess from the remaining choices. You should rarely spend more than three minutes on any given problem. If you’ve spent that much time, unless you either are seconds away from the answer or have lots of time to spare, you are best off making an educated guess at that point. In fact, if you are 30 seconds into a problem and have absolutely no idea how to proceed, you may want to make an educated guess and save the time for problems that you have a better chance at. When you face a challenging question on which you must guess, do so without worry and then completely forget about that question. Instead focus on the next question because you should always give your 100% undivided attention only to the question at hand. Remember that you do not have to get almost every question correct to score high. You can miss quite a few questions and still score in the 700s thanks to the adaptive format. In fact, it is possible to miss up to 20% of the questions and still score at the 99th percentile. As you get more questions correct than incorrect, your scoring level trends higher. The key is to avoid missing too many questions in a row, because several consecutive wrong answers will cause your scoring level to drop. Ideally you don’t want to miss more than one question in a row, because an incorrect answer followed by a correct response will largely cancel each other out. But a couple strings of two or three consecutive incorrect answers shouldn’t hurt too much as long as you get more questions correct overall.